We must have the proper knowledge of how to select a perticuler filter system as per the requirements givne application. We also have enough knowledge of dirt capacity & filter efficiency. Now a days, for liquid filter testing, there is no standard. For external use of any filter, we must use the validation guide which is provided from the filter manufacturer. in this guide they provide all specific data which are calculated from last test procedures. Earlier some tome ago, cartridge filters were desiged and manufactured from different types of materials like Square Weave S.S. Mesh. here, in this filter, every hole or pore is generally with the same size. We can conclude this measurement by taking evaluation of thickness and wire counts. We can also measure it by taking direct observation under Microscope. For manufacturing or developing filter, we can use different types of weaves of the mesh. so it is quiet hard to measure by count and thickness of wire. therefore we have to developed other methods for filters. In this Glass Bead Test, Glass beads suspensions are passed through a test filter with fulfilling some perticuler test conditions. After passing, All filtered suspension ar passed through an analysis membrane. In this analysis mambrane, all filtered suspension is measured, and then largest glass bead is identified and measured. It is very important to take measurement of rating of the filter. This absolute rating of the filter is very useful for biggest hard spherical particle..
To select a proper filter system for the requirements of a given application, knowledge of filter efficiency and dirt capacity is required. The filter manufacturer needs to provide data, which are based on test procedures simulating real parameters on a laboratory scale. At present there is no standard for liquid filter testing (except multipass test to ISO 4572, which is for hydraulic filters). Early cartridge filters were constructed from a square weave S.S. mesh. In this case, every hole or pore is nominally the same size. This measurement can be accomplished by evaluation of wire counts and thickness or by direct observation under microscope. As filter developed, different weaves (Photograph of woven wire mesh) for the mesh is being used and now it is difficult to measure by count and thickness of wire. Consequently, a number of methods of establishing the particle removal rating were developed. ARP901 extends the method to triangular holes in flat plates, but it must be recognized that the measured differential pressure is also dependent on the shape of the hole. 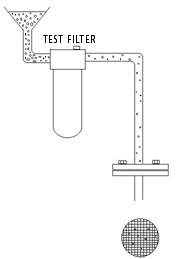 Both the glass bead test and the bubble point test were historically reputed to provide an absolute rating for the filter media, but also implied that this was a cut-off point, in the sense that in service no particles below this size were removed, and all particles above this size were removed. Both methods were based on spherical particles, which only occur rarely in real filtration applications. In an effort to address these difficulties, a further test was developed, and is also included in MIL-F-8815. This has been called the "nominal rating"
This is used for the evaluation of hydraulic filters. A test contaminant is added to hydraulic oil and re-circulated through the filter under test. Samples are taken from upstream and downstream of the filter for particle counting, and hence efficiency evaluation. The amount of solids added can be used to determine the apparent dirt capacity. The test simulates the conditions a hydraulic filter would see of a re-circulating contaminant in a closed loop. For most filters used in the process industries this type of operation is not applicable. Generally they are used for low viscosity fluids such as water, on a single-pass through the filters. The concern of the user is the quality of filtrate downstream of the filter after a single-pass, and the life on stream.